It wasn't a tropical fruit or a fatal accident. Actually I guess the proper term is "mangle iron." This was another labor saving device acquired at the time when the electrical system was converting from 25 cycles to 60 cycles. All motor driven appliances had to be changed. This included the Westinghouse and the fan. Also Union Electric was interested in getting it's customers to use more electricity. Therefore, Dad was receptive to such a contraption as the mangle. It can be described as a cabinet based ironing press with a rotating padded core and a heated iron shoe which pressed against the backside. When all was running well, the operator sat in a comfortable position before the machine. The laundry work to be pressed was first sprinkled well with water from a catsup sized bottle that was fitted with a nozzle type head. The clothing was then rolled up tight, to allow the moisture to spread evenly throughout. 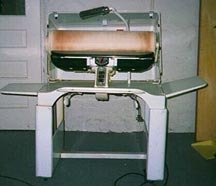 Once that was accomplished, the piece was placed on the padded core and the heated iron was dropped into position while the roller was started. If everything was done correctly, out would come a perfectly pressed shirt, slacks, tablecloth, or etc. I bugged mom enough to finally get permission to try my hand. I was only allowed to do the pillow cases, handkerchiefs and napkins. Would you wonder why?